Click here to our recorded webinar to find out how The Value Chain Academy assisted several organizations to achieve their desired results by creating a continuous supply chain learning environment. Hear from Alfons Willemsen, the company’s CEO and partner of Involvation, as he explains the Mindmap experience in this session moderated by Martijn Lofvers (Supply Chain Movement). 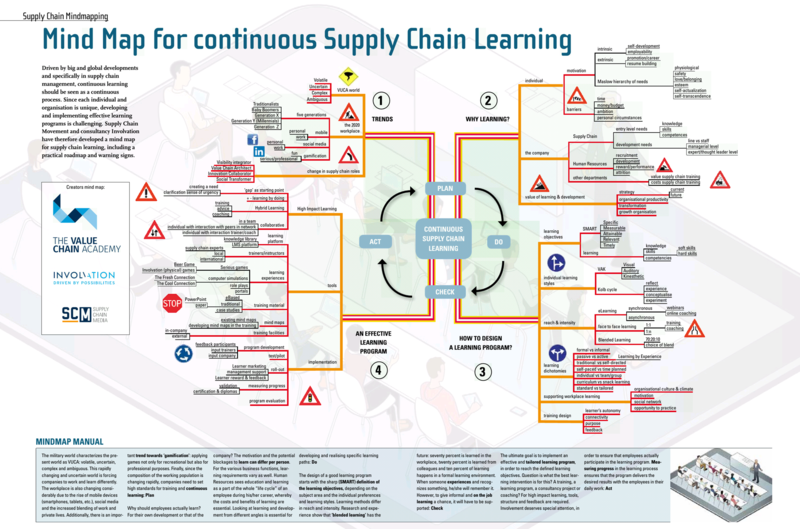 The purpose of the Mindmap for Continuous Supply Chain Learning is to provide a tool for this visualization within organizations. The mindmap helps organizations to thrive in the rapidly changing environment by enabling their employees to acquire the right knowledge and create the right mindset for competitive corporate innovation. Investing in creating a learning organization environment today empowers great corporate results tomorrow.